Food features prominently on my agenda of pleasures in life, often overlapping neatly with travel, another priority for me. Naturally, I’ve spent many hours ogling cookery books with their gorgeous pictures of artfully arranged meals but I’m not averse to word pictures of food in fiction either. Here are five favourites which should get you salivating if you have a similar predilection. All but one have links to longer reviews if your appetite’s been whetted. 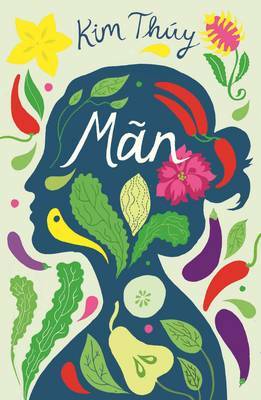 Kim Thuy’s slim, beautifully expressed Mãn is a love story, a work of aching nostalgia and a glorious celebration of language and food. It’s about a young woman who leaves Vietnam for Montreal to marry a man she doesn’t know – a match made for security rather than love. Her husband is older than her, a cafe owner who serves up soup and breakfast to émigrés longing for their families and a taste of home. Quietly and carefully Mãn introduces more dishes until the café becomes a restaurant, growing into a cookery school, then a book is published and a TV show made. She finds herself fêted, a quiet celebrity not only in Canada but in France where the Parisians eagerly attend her book signings. The powerful link between food and memory runs throughout this lovely novella. It’s a quiet triumph – the kind of book that can be read and re-read many times. Kudos to Sheila Fischman for such a sensitive translation of a book in which the nuance of language is paramount. N. M. Kelby’s White Truffles in Winter keeps us in Paris with the story of the last days of the celebrated chef Escoffier who died the year after Binh was faced with his decision. It’s an affectionate portrayal of a man dedicated to the pursuit of perfection but who knows how to make chicken taste like sole when the fishmonger fails to turn up. At the end of his life – his wife desperate to have a dish named after her as the great man has done for so many others – Escoffier is still obsessed with Sarah Bernhardt with whom he has enjoyed a long intimacy, willing to teach the sassy Sabine how to cook for the resemblance she bares to Bernhardt alone. Kelby’s novel recounts the trials and errors of the quest for a dish worthy of the wife Escoffier has adored for decades despite his passion for another woman. In Jonathan Grimwood’s The Last Banquet, we first meet the orphaned five-year-old Jean-Marie in 1723 enthusiastically eating stag beetles, analysing their taste and describing it to himself. He’s rescued by the Duc d’Orléans who introduces him to the delights of Roquefort and sets him on a path which takes him to the military academy where he meets friends who will remain influential throughout his life. He’s the embodiment of Enlightenment values – he corresponds with Voltaire and writes the Corsican entry for Diderot’s Encyclopédie, he’s a deist fascinated by science and his enlightened ideas extend to the way he runs his estate. Despite his many interests and responsibilities, he never loses his culinary curiosity. For Jean-Marie, the whole world’s a pantry and continues to be so throughout his long life during which he consumes an astonishing variety of things, from flamingo’s tongues to well, you’ll have to read it to find out what the last banquet is. It was a toss-up between Merritt Tierce’s Love Me Back and Stephanie Danler’s Sweetbitter for my fifth foodie title, both excellent novels set in restaurants. In the end, I plumped for Danler’s book, a twenty-first century Les Liaisons Dangereuses. Tess begins her training in what her roommate calls the best restaurant in New York, subjected to endless snipey backchat, given the dirtiest jobs and expected to know everything without being told. Eventually she’s singled out by Simone, revered for her esoteric knowledge and expertise. Tess also has her eye on Jake, aloof and well-known for his promiscuity, but finds herself drawn into the orbit of these two and their dangerous games. Danler writes beautifully about food in this thoroughly engrossing, acutely perceptive portrait of a young woman whose idealism is stripped from her. Any novels about food you’d like to recommend? This entry was posted in Five Books I've Read, Reviews and tagged Food in fiction, Jonathan Grimwood, Kim Thúy, Love Me Back, Mãn, Merritt Tierce, Monique Truong, N M Kelby, Sheila Fischman, Stephanie Danler, Sweetbitter, The Book of Salt, The Last Banquet, White Truffles in Winter on 18 May 2018 by Susan Osborne. Those lovely people at Shiny New Books have been busy again. A new issue came out on Monday. Lots of reviews, interviews and features by some of my favourite bloggers and a host of other contributors to keep you going for some time, although there are also ‘inbetweenies’ published between issues should you gobble it all up. Sign up for the newsletter and you’ll be kept informed. My own contribution is a review of Kim Thúy’s lovely Mãn, exquisitely translated from the French by Sheila Fischman. This slim, very beautiful novel is a love story, a work of aching nostalgia and a glorious celebration of language. If you want to read more of my review and explore the many other contributions on offer just click here. This entry was posted in Reviews and tagged Kim Thúy, Mãn, Sheila Fischman, The Clerkenwell Press on 8 October 2014 by Susan Osborne.